Baboon tarantula spiders belong to Theraphosidae family. These inhabitants of Africa form part of the tarantula genus and look quite like baboons due to their black hairy exteriors. Though not hazardous to humans, their venom, like various tarantulas is very strong and causes painful bites. Hercules baboon spider, other than being among the heaviest and largest known spiders, is also the rarest. It was in 1900 only that they discovered a lone specimen of this rare spider. Because it is so rare, it is nearly impossible to assess its size, though going by rumors they can attain sizes larger than the bird-eating Goliath tarantula. 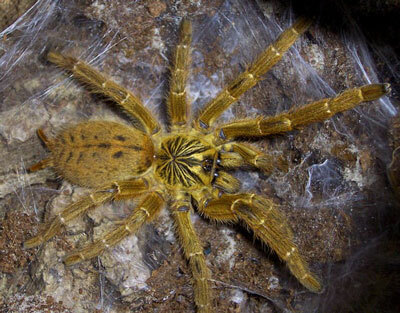 Because of its scarcity, it is among the most sought after arachnids, especially among the pet traders. It is a common belief that a large variety sold as Hercules baboon spiders is in fact the small version of king baboon spider. This variety of spiders live in the ground. They dig silk lined hideaway, usually beneath the rubble and stones, using their chelicerae and fangs. They prefer living in grasslands, dry scrublands and savannah woodlands. In barren areas, they make a deeper hideaway to protect themselves from the heat. 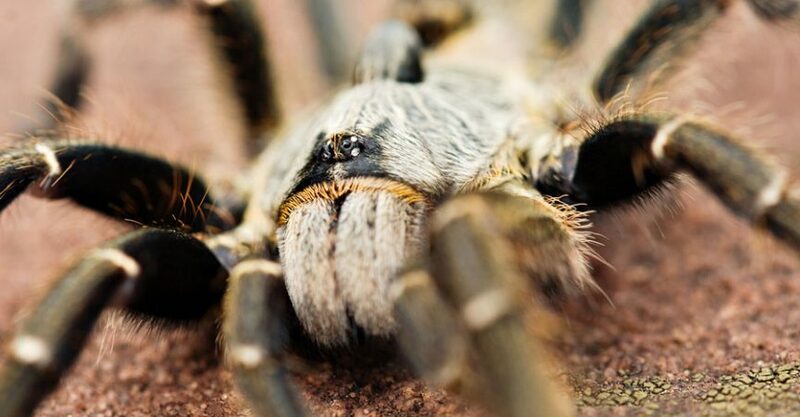 Like their cousins, the African baboon spiders live on insects, bugs and smaller spiders. Probably, they leave their dark burrows after nightfall and look for their dinner. Like other spiders from the tarantula family, they use their powerful jaws and venom to get hold of prey. These are aggressive and depend on cockroaches, beetles and smaller spiders for their food, though they are capable of killing and eating lizards, snakes, mice and birds. Unlike the other tarantulas, the baboon tarantulas do not have urticating hairs, leaving no opportunity for causing skin itching and eye inflammation in human beings. However, these animals are extremely aggressive. The baboon spiders are big, having a body size of thirteen to ninety millimeters. Their color varies from shades of brown, yellow, gray and black. Their exteriors are quite hairy. Their abdomen has spotted multicolored markings while carapace generally has glowing bands. You can easily spot them because of their big size and hairy strong bodies. Their other distinctive feature is a wide filling of hair in the last two sections of their legs, which look like their fingers. They have padded feet. On sensing danger, the baboon spider will raise its hind legs, while spreading its front legs to its sides and expose its fangs. Summer is egg-laying time for the baboon tarantula, but not immediately after mating, and the number of eggs varies with the spider genera. They deposit the eggs in a waterproof sack made from their silk secretions and leave them at the bottom of the burrow. The female looks after the eggs and the spiderlings when hatched, and most of them spend over 50 days or more with the mother (depends on the genre) before they start to move. The molting or the growth process starts with the first molt-taking place in the egg. Though the initial molt takes just a few minutes, subsequent molts will take longer than an hour. They can also regenerate a lost limb after a molt. The spiderlings emerge as a crowd from the nest, and one cannot rule out the possibility of cannibalism due to paucity of food. The spiderlings that leave the mother’s (Patriarch’s) burrow, make their own burrows grouped around the adult female’s burrow. In Captivity, the spider keepers, house the Baboon tarantulas in large containers of 1 foot x 1 foot x 1 foot with deep substrate of a mix of vermiculite and peat, with a water dish. However, it is difficult for hobbyists to see the male and female mating, since often, the female makes a meal of the male. If you want to succeed in captive breeding, timing is the essence, which most amateurs are not able to comprehend. The king baboon spider is a difficult customer as a pet, but eat without any hassles. Take care however, not to overfeed them or to feed them with too large a prey that will stress them out. Another problem is that they sometimes take the food into the burrow and you are not sure, if they have eaten it or if it is rotting inside. Ideal food for the baboon spider will consist of earthworms, grasshoppers, large insects, cockroaches and mealworms. Remember this bit of advice for those who want to keep the Orange Baboon Tarantula as a pet. Be very careful with them because, their bite, even if not lethal, is very painful. These spiders always go into a threat position before biting. 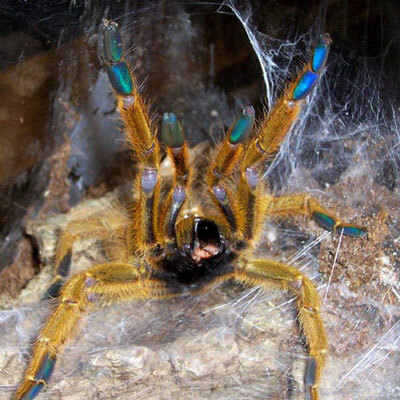 Many say that this is not an ideal tarantula for a pet.